This solution may help fix Samsung Galaxy Note 4 N910F that shows a dark display over LCD screen.This problem is a failure of the LCD’s white backlight LED bulb. To quickly fix the problem you may check the highlighted components showed below. Those are the key components that holds for the LCD’s backlight LED. LCD connectors in Samsung Galaxy Note 4 N910F or any other mobile phones for that matter are a little fragile. They can get damaged because of many reasons. Most of the times, LCD connectors get damaged because of poorly connecting and disconnecting LCD or if your mobile phone get water damaged they can easily get rusted and as soon as you unplug the LCD they crack. Replace the LCD connector if you think it’s damaged. 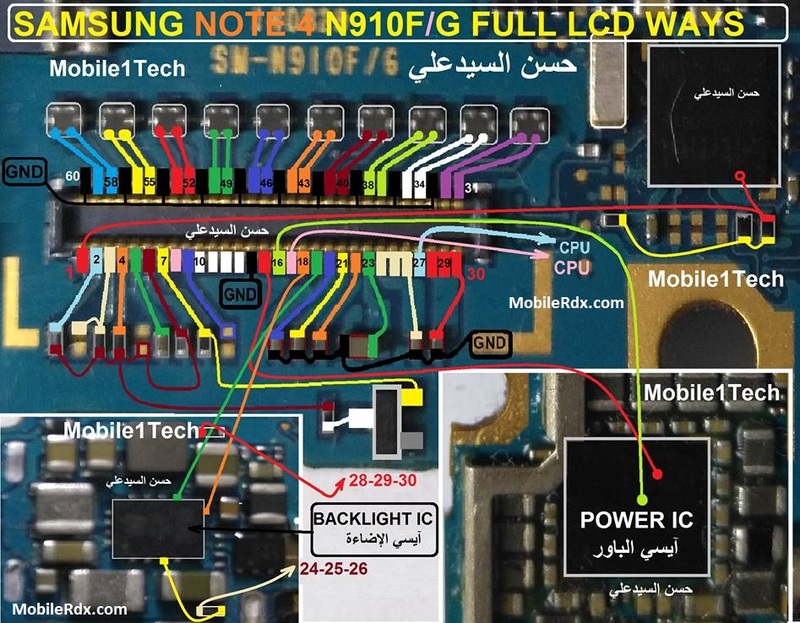 I have also marked all of the Samsung SM-N910F LCD connector jumper ways in the diagram below. Only make the jumper if the connection prints are damaged. Here are Samsung Galaxy Note 4 N910F Display connector jumpers ways. Please study these diagrams very carefully before you start repairing. If you do have hardware problem, follow the simple hints below. 1) Check the flex and LCD pin to pin connections, ensure that it is properly in good contact. A weak or loosen contacts will cause the display problem. 2) Check the LCD screen for possible damaged or cracked. If you ain’t sure better have a extra LCD at hand just for a quick test. 3) Check the flex ribbon cable for possible damaged. , the possibility of display problem is cause by flex failure. 4) If both the flex and LCD were already confirmed working and okay. You may then proceed in troubleshooting certain components on the Samsung Galaxy Note 4 N910F PCB board.